Your guide will lead you along the gentle waters of the Upper Zambezi as you enjoy a pleasant adventure in Zambezi National Park. Start with a continental breakfast and safety orientation, followed by a quick ride to the park. You may spot wild animals as they come out for a drink from the river. Stop for a picnic lunch before finishing your journey in the mid afternoon. Items of a personal nature. Please note: Zambezi Canoe Safari Activity Rate does not include Park Entrance Fee and River Usage Fee which is currently US$10.00/person. On these trips guests paddle their own canoes, following their qualified Canoe Guide as he leads the way. Clients are collected at approximately 7.00 am. Clients take short game drive in an open vehicle into the Zambezi National Park perhaps seeing some game on the way. A continental breakfast is served and the guide will give a thorough safety briefing, which will cover: safety conditions of the river, rapids, canoeing instruction, and general information. You will be asked to sign an indemnity form. The time is spent canoeing (18kms) downstream, running small grade one and two rapids, exploring channels and bird and game viewing. A picnic lunch is served on the mainland or an island. Cold soft-drinks, mineral water and beers are served at the take out point at the end of the trip and clients are back in Victoria Falls by about 2.00 pm. 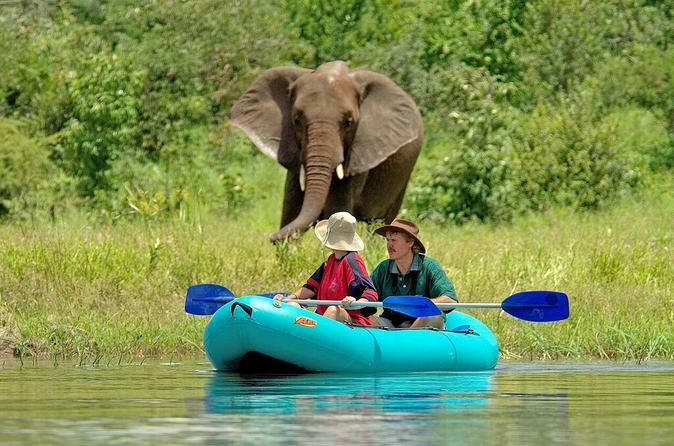 The majority of people who join a Zambezi Canoe Safari are first time canoeists. No previous experience is required as Wild Horizons staff are trained to prepare and guide you through the day. Children from 7 upwards can canoe if accompanied by a parent and fit into a life jacket. Management retain the right to refuse a child who they feel is unsuitable for the activity for any reason.